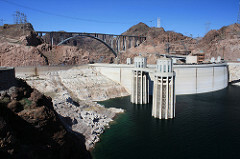 The world Hoover Dam made is now facing the era of limits. For decades California was able to use Colorado River water formally apportioned to Arizona and Nevada, because those states weren't developed enough to use their full allocations. That condition ended in the mid-1990s, at which point California had to give up nearly 20% of its Colorado River supply. Thus far we've managed a "soft landing" from that shock by crafting intricate reallocations of water among the state's agricultural, urban and ecological interests. But the balancing act is only getting harder, as a long drought shrinks our water-supply cushion and population growth continues almost unabated. Up to now, solutions to our water needs have been worked out in a crisis atmosphere. In the future, they'll take place against a political background too. In the Central Valley, farmers are already marching to demand the construction of more dams to provide more water for irrigation, as if one can just create abundance out of thin air. Environmentalists' efforts to discharge water from reservoirs to preserve riparian and marine habitats draw the ridicule of conservative television pundits. Private companies have moved into the water business, figuring that where there's scarcity there are profits. The demand for water from the Colorado River Basin has now far outstripped supply, and the problem's only getting worse as temperatures rise and the water table is shrinking. Thanks to a decade-long drought, the Lake Mead reservoir in Nevada is about 120 feet below its high-water mark (and if it dips another 42 feet, the dam will have to shut off and will no longer be able to provide hydroelectric power for the region). Officials in Las Vegas and elsewhere are discussing strict water-management measures—like recycling gray water for lawncare—for the first time. When the Hoover Dam was originally proposed in 1922, governors from the seven states in the Colorado Basin were told that the new reservoir would provide enough water to meet all their needs and allow growth without end. Alas, that's no longer the case.